Tier I – A long term, program level analysis for the future of the Highway 1 corridor between Santa Cruz and Aptos. The Tier I concept for the corridor would be built over time through a series of smaller incremental projects (referred to as Tier II projects). Tier II – Project level analysis of a smaller incremental project within the Tier I corridor which would move forward based on available funding. Each of the Tier II projects would have independent utility and benefit to the public and Highway 1 operations. The first Tier II project currently under review is northbound and southbound auxiliary lanes between 41st Avenue and Soquel Drive and a pedestrian/bicycle overcrossing of Highway 1 at Chanticleer Avenue. Preliminary design and environmental analysis has begun on a second Tier II project for the construction of a pedestrian/bicycle overcrossing of Highway 1 at Mar Vista Drive in Aptos. This project will have a separate environmental document for public review and comment later in 2018. The combined Tier I/Tier II Draft Environmental Impact Report/Environmental Assessment (DEIR/EA) were released to the public for review and comment in November 4, 2015, through January 25, 2016. Caltrans received a total of 263 letters, emails, and recorded comments from individuals, organizations, and public agencies on the draft environmental document. This correspondence generated over 900 separate comments for which responses are required as part of the final environmental document. In review of the comments received, the project team has identified a need to update the air quality, natural environment, traffic operations studies, and reporting of the cumulative impacts of the project alternatives. Update of these studies is required due to changes in regulatory guidelines and requirements, and to properly respond to the comments received on the draft document and technical studies. The hard copies of the Draft EIR/EA are available in archive at the following libraries: Aptos, Capitola, Central Library, Live Oak, Scotts Valley, and Watsonville. Copies are also available for viewing at the RTC’s Office; 1523 Pacific Avenue, Santa Cruz, 95060, and available online here. To be notified of updated material and activities, please subscribe to Hwy 1 eNews. The Highway 1 Corridor Investment Program is a planning and funding program focused on the section of Highway 1 between San Andreas/Larkin Valley Road and Morrissey Boulevard. The long term concept of the Tier I project is to reduce congestion, promote the use of alternative transportation modes as a way to increase transportation system capacity, and to encourage carpooling and ridesharing. Bottlenecks along Highway 1 in both the southbound and northbound direction that cause congestion on a regular basis during peak travel periods. Travel time delays that are experienced by commuters, commerce, visitors, and emergency vehicles at various times of the day. “Cut-through” traffic, or traffic on local streets, that occurs and is increasing because drivers seek to avoid congestion on the highway in search of “short-cuts”. Limited opportunities for pedestrians and bicyclists to cross Highway 1 within the project corridor. Recognize the limited funding available from state and federal sources and to be prepared to compete for discretionary funding opportunities when it periodically occurs at the state or federal level. The environmental evaluation of the Corridor Investment Program is referred to as the Highway 1 Tier I/Tier II Draft Environmental Impact Report/Environmental Assessment (DEIR/EA) and meets both state and federal environmental requirements. The Tiered approach to the project represents a significant shift from initial approach seeking environmental approval to construct the entire project at one time. This shift was necessitated by both the lack of state and federal funding, and the cost estimates of the full project- well beyond what could be generated locally and dedicated to the highway corridor. The current plan allows for a balanced approach to address the range of needs in the county; including local street and road maintenance and repair, school traffic safety projects, bus service and elderly/disabled transportation, pedestrian, and bicycle projects, and preservation of the rail corridor. The No Build project alternative forecasts future conditions along the corridor in the event no capacity or significant operational improvements are made to the highway. The No Build baseline condition of the corridor is then compared with the two project build (the HOV and TSM) alternatives to identify both adverse and beneficial impacts along the Highway 1 Corridor. The Tier I project scenario chosen as the long term corridor plan will be implemented as funding allows, through smaller Tier II projects of independent utility and benefit to the public and Highway 1 operations. 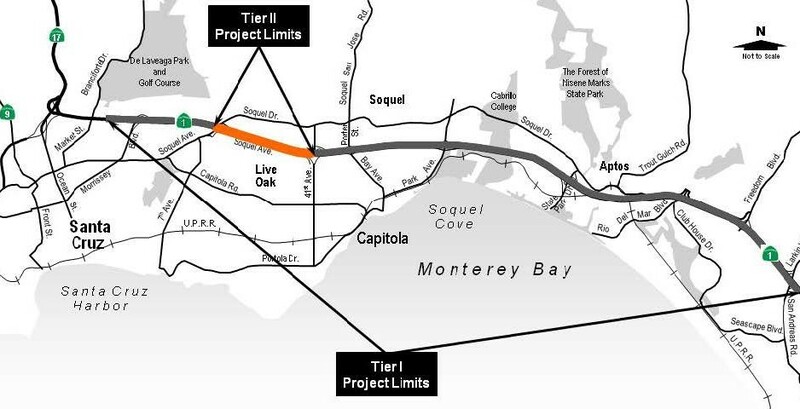 The current Tier II project under environmental review includes north and southbound auxiliary lanes between 41st Avenue and Soquel Drive and a bike/pedestrian overcrossing of Highway 1 at Chanticleer Avenue. This project is compatible with either of the Tier I project build alternative (the HOV and TSM project alternatives). Construction of this project could begin as early as Fiscal Year 2020-2021, depending on funding availability. Future Tier II projects will be subject to separate project level environmental analysis as part of the project development process and will be consistent with the long term (Tier I) vision chosen for the Highway 1 Corridor. Construct auxiliary lanes and bike/pedestrian overcrossings in phases between Larkin Valley/San Andreas Road and Soquel Drive, including replacement of the Capitola Avenue Overcrossing, Santa Cruz Branch Rail Line, and Aptos Creek Bridges. Projects along the highway to construct auxiliary lanes would be completed consistent with the long term Tier I vision for the corridor. After the 41st Ave – Soquel Dr Auxiliary Lane project, the next Tier II projects would be auxiliary lane projects between the State Park Drive interchange and the Bay/Porter interchange, as proposed in the Measure D Transportation Improvement Plan. Construct full or partial interchange improvements consistent with the long term vision for the corridor, including local roadway and ramp improvements to accommodate a future ramp metering system. Construct new median HOV lanes if the Tier I HOV Lane Alternative is selected as the long term vision for the corridor. The improvements listed above are prioritized based on traffic operational conditions and the timetable will be determined primarily by available funding. Planning level construction estimates (including all project development costs and right-of-way) for the Tier I Corridor Alternatives are $640 million for the HOV Lanes Alternative and $265 million for the TSM Alternative (in 2017$). Typically, project development costs (environmental documentation, final design engineering, right-of-way administration, construction management, program oversight, public outreach and contingencies) range from 40 to 50 percent of the estimated construction cost. The preliminary capital construction cost estimate (excluding project development work) for the Tier II 41st Avenue/Soquel Drive Auxiliary Lane and Chanticleer Avenue pedestrian/bicycle overcrossing is $18 million, which includes nearly $1.5 million for right-of-way and utility relocation. Construction of the Tier II project between 41st Avenue and Soquel Drive could begin as early as Fiscal Year 2020-2021, with funds provided through Measure D. The total project development cost of the Tier I project (including final design, right-of-way, project management, oversight, public outreach and contingency) and construction is estimated to be $29 million. The tiered approach to environmental analysis provides the flexibility to construct the remainder of the Highway 1 Corridor Improvement Program over time as funding becomes available and to address changing traffic conditions and priorities of the time. In 2011, the RTC allocated $4 million in State Transportation Improvement Program (STIP) funds to conduct final design and right-of-way acquisition for the 41st Ave – Soquel Dr Auxiliary Lanes and Chanticleer Bicycle and Pedestrian Bridge project. An additional $2 million in STIP funds have been reserved for the construction phase. In 2007, the RTC allocated $7.5 million in Regional Surface Transportation Program (RSTP) funds the Highway 1 Mar Vista Bicycle and Pedestrian Overcrossing project. Preliminary design/environmental analysis has begun on this project. The Measure D funds allocated to this project will ensure adequate funding is available for construction. Projecting future transportation funding is very difficult given uncertainties associated with state and federal legislation and economic conditions. Potential funding sources include SB 1, California State Transportation Improvement Program (STIP), Regional Surface Transportation Program (RSTP), other local revenue generating mechanisms, or other state and federal funding sources.